Does your favorite biker have a sweet tooth? Motorcycle Chocolates and Biker Sweet Treats are the yummiest way to impress the motorcycling apple of your eye! Tantalize everyone's taste buds with unique and tasty sweet edible items that are sure to get their motors running. Whether your are gifting to others or succumbing to your own candy cravings, here are the best chocolate gifts for motorcycle fans. There are many occasions where mouth watering chocolates and tasty sweets would make an excellent choice for a gift for that special motorcyclist in your life. Birthdays and Anniversaries are the perfect occasion to gift a personalized box of chocolates. Mothers Day or Fathers Day is an ideal opportunity to tell them how much you love them with any motorcycle themed yummy snacks. Wedding or Baby Shower guest gifts. Many of these sweet individualized edibles are the ideal take home gift for your wedding guests or baby shower attendees. Any occasion where you have special guests is a good time to gift a personalized thank you gift decorated with important names and dates. Valentines Day is a traditional time to offer up a sweet treat to that special biker guy or motorcycle babe. 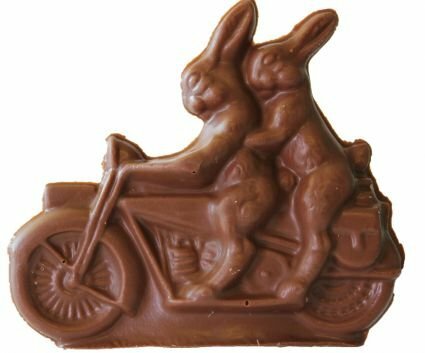 Easter is a great time for a solid chocolate motorcycle, or a gift of cookies adorned with a personal message. Christmas would not be complete without delectable chocolate gift baskets or shortbread iced with a favorite motorbiking photo memory. Offering individual sized, unique cake pops at a outdoor biker barbecue is a wonderful dessert idea! Sugar cookies decorated with your favorite patriotic motorcycle art would be a great idea for Independence Day or Canada Day Celebrations. National Just Because Day! 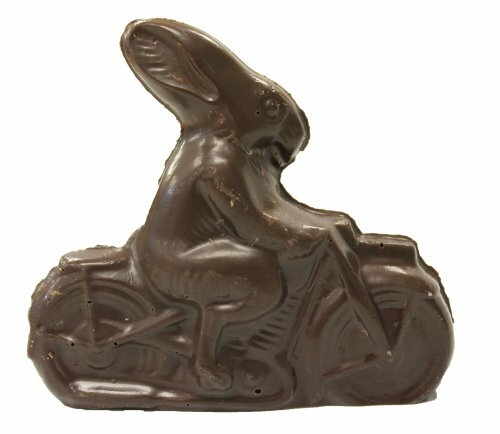 (Yes, I made that one up) is the best reason to have a celebration of edible motorcycle chocolates and biker sweet treats. Treat others or treat yourself. Any excuse for a mouthful of creamy milk chocolate or delightful decadent dark chocolate is a good one. Chocolate, Chocolate, Chocolate for your Biker Sweet Tooth! Motorcycle shaped solid chocolate, chocolate bars and boxes of delectable chocolates decorated with motorcycle graphics on the lids will satisfy even the most discerning chocoholic. 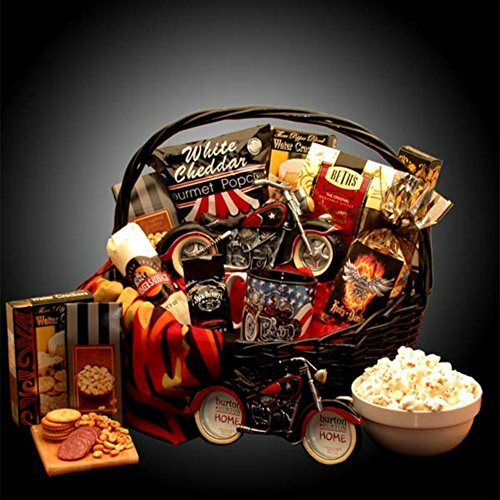 Tasteful, edible Harley Davidson gift baskets make wonderful motorcycle gift ideas. Cookies, cakes and brownies decorated with biker themed icing will give your biker the instant energy that will twist their throttle. This gorgeous solid chocolate replica of a Harley Davidson sport bike looks almost too good to eat! This beauty is created with white, milk and dark chocolate. This piece of edible motorcycle art is displayed in a sturdy wooden colector box and is topped off with an engraved image of a motorcycle racing scene. What an excellent gift idea for that Harley Davidson collector fan who has it all! 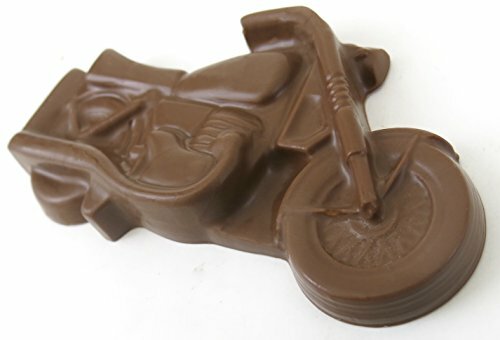 This solid smooth, creamy, solid milk chocolate motorcycle weighs in at a whopping 8.8 ounces! The chocolate is packed in a tasteful gift box, ready to give to your biker buddy. What could be cuter than chopper riding solid chocolate Easter Bunnies! These adorable cuties will make your taste buds go vrooom vrooom! They are available in both milk chocolate and decadent dark chocolate. The chocolates come wrapped in cellophane and tied with a colorful bow. Ok, its not quite a motorcycle, its a scooter, but it is just such a great gift idea. 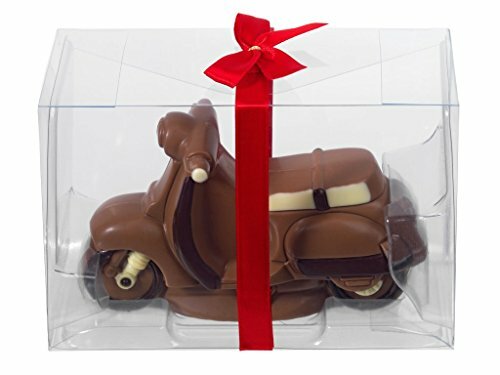 Made with a medley of white, milk and dark chocolate this delectable scooter comes in a clear box and is wrapped with a beautiful red bow. The attention to detail is amazing and is a great alternative gift for a biker who is becoming a senior as a "gag" type gift. I love gift baskets. These sweet treat laden motorcycle gift baskets are such a good idea for someone who has everything. It is so much fun to watch that motorcycle fan "ooh and ahhh" as they discover all the biker sweet treats in their gift basket. This wicker gift basket is full to the brim. The contents include a motorcycle picture frame, a motorcycle "flame" bandana, a motorcycle coffee mug, some Jack Daniels coffee, popcorn, candies and other edibles. 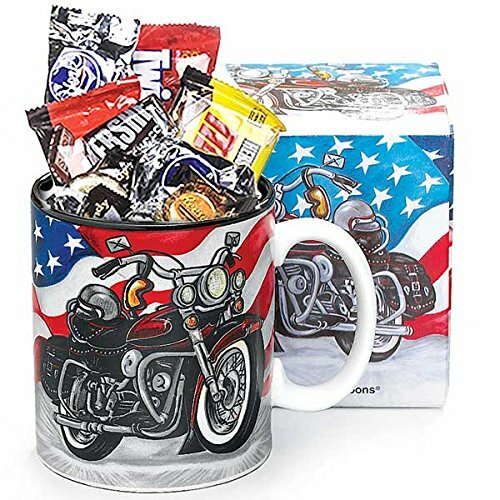 This All American 16 ounce coffee mug gift set is stuffed to the brim with choice motorcycle chocolates and classic candies. The mug comes in a decorated gift box that matches this mug. What a delightful gift for a chocolate addict! For the person who loves classic choppers, coffee and cookies, here is a 15 ounce mug gift box decorated with a collage of beauteous bikes. This gift set comes with five 2 ounce bags of different flavored ground coffees, four drink coasters to match your mug and some wonderful biscotti to dunk in your steaming cup of coffee. These caffinated goodies are all packed in a 9 inch by 9 inch by 4 inch box. 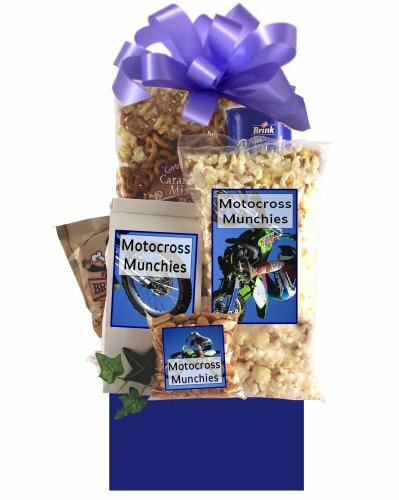 For those wild and crazy motocross maniacs out there, how about a motocross munchie madness gift basket? I am sure you are salivating at the contents of this unique gift box. Included are perfect popped popcorn, crispy crunchy cheese straws, roasted and salted nuts, tempting trail mix and two types of tasty cookies. Each bag of goodies in the gift box is decorated with a colorfully illustrated "motocross munchies" label. That should be enough energy to get you primed for your off road capers! If you are a gluten free, vegan motorcyclist with a sweet tooth, here is your way to succumb to your desires for candy! 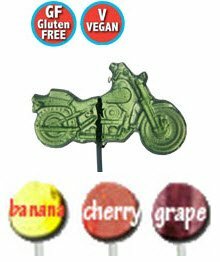 These sweet, all natural motorcycle lollipops are hand made in a gluten free kitchen with all no artificial flavors or colors. Talk about your yummy motorcycle chocolates and biker sweet treats! Available fruity flavors are cherry, banana and grape. 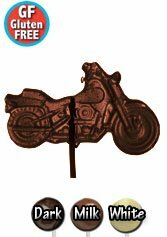 The chocolate versions of these cute motorcycle lollipops are white, dark and milk chocolate. They are sold by the pound, so enjoy some vegan treats! Yes, life is like a box of chocolates. Chocolate has health benefits, one of which is that it triggers those "feel good" endorphins. Dark chocolate, in small amounts, actually aids digestion. Most of us women motorcyclists will agree that chocolate is a mood elevator when we have those depressing days. Here are some hand crafted Belgian boxed chocolates with amazing motorcycle themed boxes. You can personalize a message on the big chocolate with a quote or name or special occasion. You can also submit a favorite motorcycle ride photo and the graphic artist will create a cover for your box of chocolates. These are creative personalized gifts that your biker will appreciate. You will melt your fudge brownie loving bikers heart with these moist, chewy, chocolate biker sweet treats. You get one dozen brownies in 2 inch by 2 inch squares or rectangles measuring 3.5 inches by 2 inches. Each brownie is decorated with custom designs on white icing and each fudge brownie is individually wrapped. These tasty squares can also be personalized with your own chosen image. Just upload the image and it will be portrayed on the white icing. Or pick one of the beautiful, richly colored pre-printed graphics to decorate your delicious brownies. These adorable bite sized cake pops are a great addition to motorcycle chocolates and biker sweet treats. You have so many choices! Chocolate, vanilla and red velvet are the yummy handmade cake flavors. Icing flavor is your choice of white icing, milk chocolate or dark chocolate icing. No calories here! You may have trouble choosing which of the 10 colors of drizzle to highlight your cake pops with. The crowning touch on these bite sized morsels is a unique motorcycle themed graphic. You can either upload a personal image or choose one of the many bright, colorful designs that are available. OMG! Oreo cookies dipped in white or brown chocolate and then decorated with your favorite motorbike graphic! Does it get any better? Decadent and delicious, these are amazing biker party favors. The fact that you can personalize these delicious oreo cookies just adds to their unique appeal. There are several amazing pre-printed graphics available for you to choose from also. These are sold by the dozen. What a wonderful treat! Well don't these cute little oreos on a stick just bring a big, sticky, cookie grin to your badass biker face? Again, these are iced oreos, decorated with sprinkles and dressed up like a lollipop. Oreo pops are going to be the next big snack craze. Biker or not, these sassy little cookies will get you on a sugar high. I love how you can add a kewl picture and\or text to these pint sized cookies to make them individualized. Buttery, yummy, beautifully decorated, melt in your mouth shortbread cookies are gifts cookie lovers will thank you for. These uniquely decorated cookies can be personalized with your own photo or message. The shortbread biscuits are freshly made with all natural ingredients and are frosted with royal decorating icing. Then your chosen (or personal) motorcycle photos are printed in bright colored, edible icing images on top of the tasty shortbread cookies. These delicious gift cookies are sold in different shapes and sizes. There are round and rectangular taste tempting shortbreads sold in packages of four. Enjoy a jumbo rectangular shortbread cookie (11.25 inch by 8.75 inches) and weighing 18 oz of melty goodness that are sold individually. Each of the biscuits are individually wrapped to preserve freshness. These tasty cookies will keep fresh for up to two weeks. Personalized Sugar Cookies - Oh Yah! Send your taste buds on a cruise with these amazing biker themed sugar cookies. What a great idea for a gift to that special guy or gal who lives to ride. The graphics on these edible works of art are spectacular and you can personalize with your own individual style. Each freshly baked sugar cookie is glazed in white chocolate flavor icing and then printed with the edible photo graphics. You can individualize with your own favorite photo or a personal text message. Each cookie is 3.5 inches, individually wrapped in cello and then sold in batches of a dozen. Serve these with your favorite herbal tea or hot chocolate. 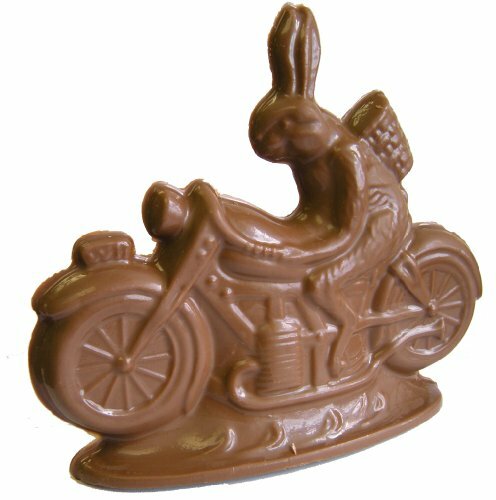 That way you can have motorcycle chocolate AND a biker sweet treat in one sitting! Thank you for reading my sweet article on yummy motorcycle chocolates and biker sweet treats. I know that I have provided you with a selection of high quality products that will give you a wonderful chocolate and sugar buzz until your next motorcycle adventure.